Today’s reading from the Gospel of John is remarkable (John 1:29-34), packed with powerful ideas that amplify the awesome nature of Jesus Christ. In just 5 verses, John the Baptist reveals a powerful summary of the whole Gospel. And he does it in a way that is mysterious and prophetic. “the Lamb of God” – The phrase “Lamb of God” only appears two times (John 1:29, 1:36) in the Gospels – both times uttered by John. 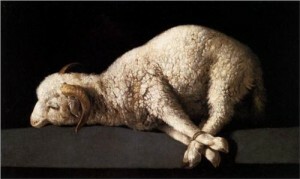 While mysterious in origin, Lamb of God brings a number of allusions to mind, all of which have to do with the sacrifice of a sheep: Abraham’s attempt at sacrifice of Isaac where God provides the ram (Gen 22:8); the lamb slaughtered at Passover for the deliverance of Israel out of Egypt (Exodus 12); Isaiah’s use of a lamb to describe the Servant who bears sin (Isaiah 57:7). What is remarkable is that in John the Baptist’s description of Jesus as the Lamb of God is prophetic: Jesus really is slaughtered, like a lamb for the sins of the world in three short years. In a later post during Easter, a discussion about how Jesus actually follows in the steps of lambs led to Passover slaughter will be detailed. John ‘saw’ the Spirit descend like a dove from heaven – John the Baptist has clearly seen something that no one else has seen; it is a special revelation from God. John is testifying to the fact that the Holy Spirit exists, that it is real and that is comes from a real place he calls heaven. This Spirit rests and remains on Jesus – What must it have been like for John to see this and to realize what it meant? It is presumed that John is hearing the Voice of God the Father. What must that be like? John the Baptist has been baptizing with water; and now, there is someone who will be baptizing with the Holy Spirit! John must have been overwhelmed with wonder. John, despite his own large following, humbles himself and testifies to the superiority of Jesus Christ. John the Baptist realizes through revelation that Jesus is the Son of God. What must it be like to both see and know that Jesus is the Son of God? We are left to ponder: Do I accept the Lamb of God? Do I accept that Jesus is indeed the Son of God? Have I bore witness to the Son? Big questions, these.